My mom messed up her shoulder in a fall recently so I made a "wrench" in Tinkercad to give her a little more leverage to lock the bottle into her Shake'n Take smoothie mixer. 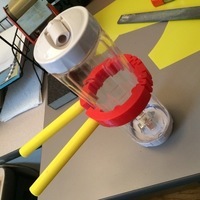 The original design ( Shake N Take Sports Bottle Wrench V2 ) proved a little weak where the handles joined the ring if too much pressure was used so I re-designed it with integral handles that are shorter (due to print bed limitations) but still provide adequate leverage with no tendency to break the ring at the joint. I hope someone finds this useful! Please post your prints and comments. This was printed on a New Matter Mod-T at default settings using New Matter filament.